The Thief is a Celestial who will seek your help once you join the Star-Gazers. She is the only one of the Guardian star signs to not have been corrupted by The Celestial Serpent, and seeks to free her fellow Guardians; The Warrior and The Mage. When the Star-Gazer's ritual ends, you find yourself in a closed off room full of bookshelves, with The Thief waiting to speak to you, and greets you by saying "We must talk. Do not be afraid. I am a friend." "Forgive me. I did not know any other way to contact you without revealing myself. Even now, the Serpent's followers, the Scaled Court, are searching for me." "I am the Celestial Thief. 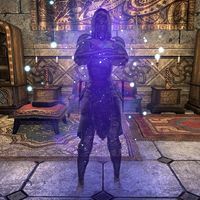 I appeared with the other guardians when the Serpent broke free and manifested in Tamriel. One by one, the Serpent trapped the others. First the Warrior, then the Mage. He wants to do the same to me." Are you saying the Serpent is controlling the other guardians? "Yes. They attack Craglorn against their will. Listen. The Serpent's nature is chaos. He wants to undermine the very nature of reality. He will not stop with Craglorn." "My power alone is not enough. You must free the other guardians. I will help you as much as I dare, but the Serpent is looking for me. If he ensnares me as he has the others, all is lost." How do I free the Guardians? "Hara and the Star-Gazers will help you. Use their knowledge. Look for the presence of the Scaled Court—where they are, the Serpent is surely at work. But you must not tell anyone you saw me. The Serpent's followers are everywhere." Are you really the Thief constellation? "In a way. Just as you might look at a picture of the star signs and say "That's the Thief" or "That's the Warrior." Just so, I'm the Thief, or one way of seeing the Thief." Tell me about the Guardians. "Of the twelve rightful star signs, it's the Guardians' duty to protect the lesser signs, our charges, against the destructive ways of the Serpent. With the Warrior and Mage under the Serpent's control, their charges are vulnerable. So is Tamriel." "It would be surprising if I didn't. The Star-Gazers are only dimly aware of it, but they carry an ancient legacy as students of the star signs. Their devotion has not gone unnoticed." Once you are finished talking to the Thief, return to Belkarth via the newly-opened portal beside her. "Friend of the Star-Gazers. Look at this place. Here, the mages of Craglorn fended off the Prince of Schemes and his Dark Anchors. But the sweet taste of victory quickly turned bitter. "The mages called on the power of the Celestial Mage. They summoned ancient and powerful atronachs to defeat the Dark Anchors and battle Molag Bal. But as soon as the Dark Anchors were defeated, the atronachs turned against Craglorn." "That's what I need you to learn. A conjurer named Kelmen Locke was present when the atronachs were first summoned. When they turned, his fellow summoners were killed. He was the only one to escape, and I fear he is in grave danger." I'll find Kelmen. But what kind of danger is he in? "Servants of the Serpent hired the feared Greycloak mercenaries to capture Kelmen Locke. The merceneries hold him in a place called Haddock's Market. When they learn all they can, they plan to hand Kelmen over to the Serpent. We need to rescue him." I'll go to Haddock's Market and rescue Kelmen. "Hurry. If Kelmen is lost to the Serpent, so too are our chances to understand why the atronachs turned." Tell me more about Kelmen Locke. "From what I've heard, he's a gifted conjurer who was greatly favored by the Mage herself before she disappeared. When the atronachs turned, the rest of Kelmen's summoning circle were killed. It's no wonder he's gone into hiding." How were the atronachs summoned? 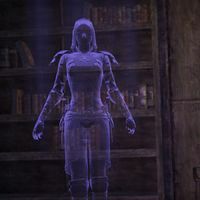 "My fellow guardian, the Mage, lent her power to the conjurers of Craglorn. It was not in our interest to see Coldharbour and Nirn joined." "She spoke to them in dreams. Not directly, of course. We prefer to watch from above rather than appear below. Only in times of great crisis do the guardians awaken and manifest. The Serpent's attack on Craglorn was just such a crisis." Kelmen Locke: "Away, phantom! Unless you are here to free me, I will have none of you." The Thief: "I'm no phantom, Kelmen Locke. I am the Celestial Thief. And you know why I am here." Kelmen Locke: "Just another bandit then? I've already been robbed blind. There's nothing more to take from me." The Thief: "The atronachs. The Celestial Mage showed you how to summon them in a dream. Do you remember? Why have they turned against Craglorn?" Kelmen Locke: "Oh no. No more Celestial Mages and Serpents! I've had enough of all that! I saw what happened to the others and that won't happen to me." If you speak to her after, she will say "How this fool ever possessed the power to control such mighty atronachs, I'll never understand." Kelmen Locke: "You know, it's very unsettling the way you pop in and out like that." The Thief: "I wouldn't be a very good Thief if I couldn't come and go as I please." Kelmen Locke: "Well, I've done what you asked of me. Are you satisfied?" The Thief: "You have done well and I appreciate your efforts. Thanks to you, the Star-Gazers now understand the nature of the atronach threat and how to stop it." "Listen closely. You were right to help Titus. Had Tarish-Zi been able to gather his forces, there would have been nothing you could do to stop them." Do you know why Tarish-Zi and the Anka-Ra returned? "Each Celestial possesses an unusual gift. The Warrior's gift is to call heroes across time. It seems the Serpent perverted the Warrior's gift, using it to awaken the villainous Tarish-Zi and his cursed army, the Anka-Ra." How did Titus get here? "My guess is that as one of Tarish-Zi's royal guard, he was summoned at the same time as the others—yet he was unaffected by the Serpent's manipulations. Perhaps because he was never truly loyal to Tarish-Zi." "See that Titus makes it to Belkarth. The Star-Gazers will give him refuge. I feel he may still have a part to play in our struggle. Continue to work with Hara of the Star-Gazers. I will reach out to you again when it is safe to do so." If spoken to before completing the quest she will say, "You have done well to stop Tarish-Zi from gathering his cursed army of Anka-Ra." After completing the quest she will disappear. "The ruse is dropped, and the thief emerges from the shadows. You see the truth. Forgive me. I wore the guise of Hara because I didn't know who to trust, but neither could I rest while the Serpent preyed on the other Guardians." You were the Thief the whole time. You appeared to me and helped me. Why didn't you trust me? "I'm sorry. The Serpent is a deceiver by nature. I couldn't be sure. When the other Guardians fell, I had to react quickly. I suspected that the Serpent was using our Apex stones against us, so I secreted mine to this ruin for safekeeping. I see. But why pose as a mortal? "The Serpent is cunning, but he has his blindspots. He does not value the strength or cleverness of mortals. Taking the form of Hara, a mortal, allowed me to find champions—like you—to join the fight against the Serpent, while eluding his gaze." "We should return to Belkarth. There is still much to do, if we're to free the other Guardians and stop the Serpent. But I'm done hiding. The Star-Gazers deserve to know the truth. I can transport you back to the city if you wish." I'm ready. Take me back to Belkarth. "I can't thank you enough. You trusted me, even when I'd failed to show the same trust in you. I won't make that mistake again. From here forward, we must work together closely if we're to defeat the Serpent." "We've sent the Serpent reeling, but he will strike again. We need to use this time to prepare our forces and free the Mage and the Warrior. The Serpent can only be defeated through the combined efforts of all three guardians." "Use this time to gather your allies, sharpen your skills and hone your reflexes. We've won a great victory, but the war has only just begun. When the time is right to go on the offensive against the Serpent, I will call for you to lead us. The Warrior: "The Serpent no longer clouds my mind. My sword will claim his neck." The Thief: "The Serpent belongs in the natural order. We will stop him, not murder him." The Warrior: "All talk and no action. Fall in behind me. The Serpent will learn his lesson." In the Howling Sepulchers: "Well done! With the farsight ritual complete, I can now locate the source of the magical disturbance." "The Scaled Court's venomous leader killed poor Kelmen without remorse or hesitation. But the ritual worked. I know where to find her—Loth'Na Caverns." You can ask about your work with Little Leaf and Cassipia, if Kelmen is truly dead, and what just happened. I met Regent Cassipia and Little Leaf. "Indeed? And they still live? Why didn't you destroy them when you had the chance?" They needed help. They said they opposed the Serpent and the Scaled Court. "Oppose the Serpent? This Cassipia wants to replace the Serpent! But what's past is past. Did you notice anything? Did Cassipia collect any unusual components?" She collected something from the mantikoras and the armored trolls. And some of the nirncrux. "The nirncrux? I fear this Cassipia may have discovered a secret I thought lost with the ancient Nedes. The threat she presents is greater than I anticipated. We must hurry to Loth'Na Caverns!" "He tried to stop Regent Cassipia on his own. She was too powerful for him. I just hope poor Kelmen is finally at peace." Why did Kelmen go after Cassipia by himself? "I can only speculate. It's obvious they knew each other from Kelmen's time in the Mages Guild. I think he recognized her hand in this and went to convince her to stop her mad plans. Unfortunately, she refused to be swayed." I'm not sure I understand what we just watched happen. "This Regent Cassipia, the leader of the Scaled Court. She plans to somehow gain the powers of a celestial. To make herself the Serpent's equal. She has much to answer for, not the least of which is the murder of Kelmen Locke." Gaining the powers of a celestial is bad? "For one such as Regent Cassipia, yes. Very bad. By her own admission, Cassipia plans to remake the world. We cannot allow that to happen." Can Cassipia really become the Serpent's equal? "Stranger things have happened in the past. As one of the Celestial Guardians, it is my job to oppose the Serpent and his followers. This Cassipia appears to be the worst of them. We must go to Loth'Na Caverns and stop her." The Thief: "Regent Cassipia! You must not continue upon this dangerous path." Little Leaf: "No! You don't understand! Leave us alone and everything will be fine." The Celestial Thief opens a portal to Belkarth, to the Star-Gazer's Observatory—the place where all this started. Talk to the Thief in the eastern corner of the upper floor of the Observatory. "Regent Cassipia reached for powers that were not hers to acquire." We stopped Regent Cassipia from becoming the Exalted Viper. "And so we did. Cassipia and Little Leaf's deaths were regrettable, but they were a necessary evil in our efforts to save Craglorn. You have provided another great service to the Guardian Celestials. For that, you have my gratitude." "Regent Cassipia and Little Leaf wanted to change the world, but the cost was too high. The Serpent, the Viper … whatever you call it, a snake is still a snake." The Thief wears Outlaw-styled medium armor. She has been wearing this apparel ever since being added to the game in Update 1, though the motif was only made obtainable in Update 9. The Thief can sometimes be spotted walking the roads of Craglorn with a clipboard and quill, similar to a traveling merchant. After speaking to Kelmen Locke in Balamath, the Thief will disappear (as intended) but re-appear some time after. She cannot be interacted with at this location. This page was last modified on 3 February 2019, at 08:48.